Uh-oh dear readers, I have committed the cardinal sin so close to Christmas. Yes, I have purchased a handbag...dun dun dun!!! It's almost my birthday (Christmas Day to be precise) and I decided that an early birthday present to myself wouldn't be such a bad thing, particularly as I'm going to use the majority of my birthday money to pay off the handbag debt, like a good little fashionista should. And besides, I want to make sure that I stay on Santa's nice list after all of the hard work and effort I've put into making everyone else's gifts just right. Which handbag I hear you cry? THE handbag of the moment (in my eyes anyway! 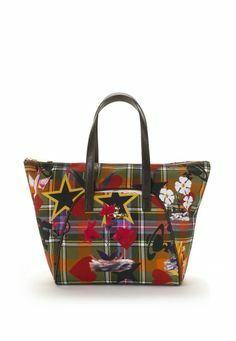 )...the Vivienne Westwood Sea Monster Tartan handbag. Eek! I've been talking about it forever, I tried and failed miserably to buy it in London in September and I paraded around the Leeds store with it just a couple of weeks ago...and soon it will be mine...YIPPEEEEEEE!!! But I can't stop thinking about it. I ordered it on Tuesday...and it's not here yet *sigh*. Good things come to those who wait I suppose. I can almost hear the shuffle of the orb-printed tissue it will be wrapped in. Please delivery it safely Mr Postman!! How many more sleeps until it gets here...?!! !